Where does Bernie Sanders stand on the issues? 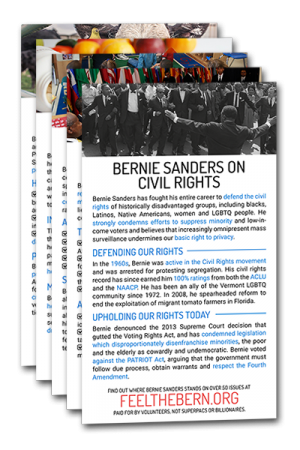 Get your Bernie Sanders Flyers Today! Download, print, and get out the vote! people have endorsed Bernie Sanders! Get useful updates on our site, future releases, and other grassroots Bernie news. This website was built & is maintained by volunteers with no official relation to Bernie Sanders. We’re regular people, unassociated with any Super PACs or billionaires.